Battlefleet Gothic: Armada shows its Early Adopter offer and unveils its Narrative Trailer! Battlefleet Gothic: Armada, the new space RTS set in the Warhammer 40,000 universe from Games Workshop, today unveils the Narrative Trailer. This video, composed from some of the game's cinematics, introduces the ambitious solo campaign which will plunge players into the heart of the spectacular void battles of the 12th Black Crusade of Abaddon. 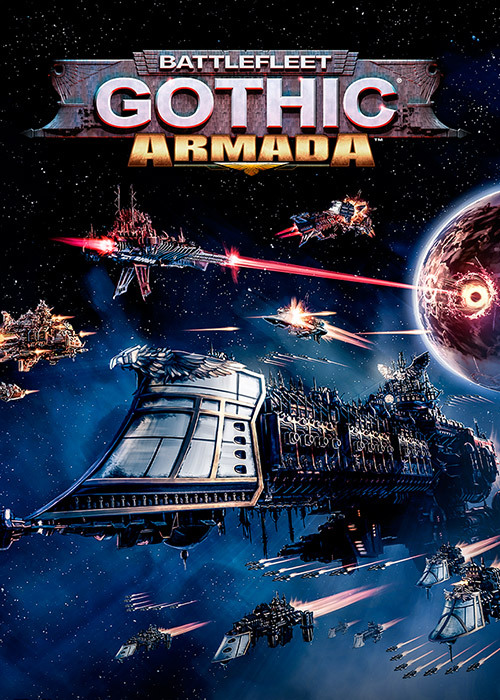 Great care has been taken with the campaign of Battlefleet Gothic, through its story and realisation. Many cinematics, astutely mixing game sequences with artwork created by talented artists, support the story and the major events of the campaign, which are sometimes influenced by the success - or failure - of the missions. The Gothic Sector is in constant evolution, and new threats often make an appearance such as the Ork pirates, or the Eldar corsairs. The Chaos forces will often launch assaults on Imperial worlds, while your allies will request your support. Quite often, multiple events will arise simultaneously, requiring you to take critical decisions and bear the weight of their consequences, such as different access to resources, or available allies... in the end, your decisions will influence the unfolding of the Gothic War itself. We are also thrilled to announce the beginning of pre-orders for Battlefleet Gothic: Armada. In order to reward the commitment of players who will support us during the pre-order phase, and those who will join the community during the first couple of months following the game's launch, we decided to offer to these 'early adopters', for free, an additional faction - the Space Marines - which will be available to play a few weeks after launch. This additional faction will be playable in battles played in both Multiplayer modes and in skirmish against the AI. Players who pre-order the game will also receive access to the Multiplayer Beta, that will start a few weeks before the official launch. Finally, we would like to remind you that until Friday evening, Games Workshop has a place of honour on Steam with exceptional discounts. This is the perfect opportunity to pre-order Battlefleet Gothic: Armada (10% off) or to join the communities of players of Blood Bowl 2 (50% off) and Mordheim: City of the Damned (40% off).